Tofu – or ‘toe-food’ as my friend’s 4 year old daughter calls it, isn’t exactly something I eat on a regular basis. Sure I love the little silken cubes that come in my miso soup, and agadashi tofu is one of the standards I order when I go out for Japanese, but apart from that tofu and I very rarely cross paths. When I decided to become vegetarian for the month of May, my motivation wasn’t about giving myself a chance to become a tofu addict. I was more looking for a way to experience a different type of cooking and eating that placed vegetables on the main stage, rather than relying on the old heros of beef, chicken, lamb and fish. While I’ve definitely had my mind opened to the world of vegetables, there have been some unexpected discoveries as well. Like that tofu can be delicious. Who would have thought? From flicking through my cookbook collection, I was surprised how under-represented tofu is. Apart from the obvious Asian references, pretty much no one else has been writing about tofu. Even Stephanie Alexander only had space for a cursory mention in her encyclopaediac The Cooks Companion. For those of you who are a little skeptical, I thought I’d pull together a little beginner’s guide to tofu. With the hope that more omnivores will choose some bean curd every now and then. I’m still on a learning curve myself so any of you tofu aficionados, please feel free to add in your thoughts and experiences. Tofu is pretty much, the soy equivalent of cheese. It’s made by taking soybeans and soaking them in water and grinding them to make soy milk. This is then treated with a ‘coagulant’ which encourages the protein to separate out of solution to form a curd – just like in cheesemaking. The curd is then separated from the watery part (the whey) and pressed into tofu blocks. The curd can be presssed more or less to give different types of tofu. Silken or Soft Tofu has the most water left in and has a lovely soft texture, but is likely to break up if you try and fry it. Firm or Extra Firm Tofu has more of the water pressed out to give a more solid, meaty texture. Not all firm tofus are created equal, have a feel of a few different brands next time you’re shopping and you’ll see what I mean. 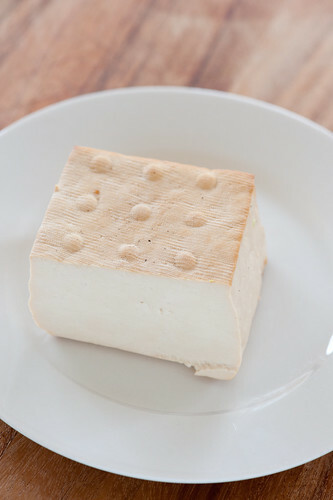 Smoked Tofu is usually firm tofu that has been smoked like smoked cheese, or more commonly has had some liquid smoke flavouring added to it. Tempeh isn’t technically a tofu, but I’ve always associated in the family. It’s actually soybeans that are cooked and fermented whole with a specific mould which breaks down the soybeans and forms a cake. To be honest I’m yet to experiment with tempeh. Brilliant advice from a comment on stonesoup by Johanna GGG.Tofu hasn’t been known to win any flavour-explosion awards for a reason. But it is great for creating textural interest and it’s also pretty good at soaking up flavours so think about marinades and sauces or adding it to flavoursome soups or stews. Just like different cuts of meat have their preferred cooking methods, so do the different types of tofu. Delicate silken tofu is best left to broths and soups where it can soak up flavour without getting all smashed up. Firm tofu, on the other hand is best pan fried until crispy on the outside and still a little soft inside or it can be roasted. Just as with all food, you get what you pay for with tofu. An organic tofu from a producer who cares about their soybeans is more likely to give you a positive tofu experience than the mass produced, genetically modified stuff. Soybeans are one of the most genetically modified crops on the planet. Now I don’t want to get into a rant about the whole GM debate here, but personally I prefer to avoid GM products. I actually studied biotechnology at university (and got a high distinction – so nerdy) and it’s not the technology itself that I have an issue with. It’s the power that it gives to big business, along with the destruction of biodiversity that makes me opt out. The choice is yours. Just like Julia Child’s advice for perfect boeuf bourgonne, damp beef (and tofu) won’t brown properly. I find it best to blot my cut tofu with paper towel before pan frying, but have also had success with giving it a light dusting of flour to help get a lovely crisp golden crust. I think one of the reasons I haven’t enjoyed tofu when I’ve cooked it before is that I’ve used brands of tofu that pack the tofu in a plastic tray with quite a bit of liquid. While labelled firm, these tofus are not that different to silken tofu. Best to stick to honest shrink wrapped firm tofus to avoid disappointment. While I’ve welcomed its wonderfully familiar flavour to help cure my bacon withdrawls, smoked tofu is strong stuff and best used as a supporting ingredient rather than starring on its own. While not strongly flavoured itself, tofu definitely benefits from some judicious seasoning either with sea salt or soy sauce. I was surprised how much I liked smoked tofu. While it would never actually replace bacon in my diet, it is something that I’ll continue to eat when I’m an omnivore. Good for when you feel like smoky bacon but don’t feel like eating meat. Feel free to use the pasta of your choice, although I think short pasta will work better here for some reason. The key to being able to make this dish in 10 minutes is to get the pasta water boiling as soon as possible and to choose a pasta shape that cooks in less than 10 minutes. Bring a large saucepan of salted water to the boil and cook the pasta according to the packet directions. Heat a large frying pan over a medium high heat with a few tablespoons peanut oil. Cut tofu into batons no larger than your pasta and pat dry with paper towel. Fry tofu until golden on all sides then transfer to a large warm bowl. Toss through egg yolks and cheese. When the pasta is ready scoop out a little cooking water into a mug then drain the pasta. 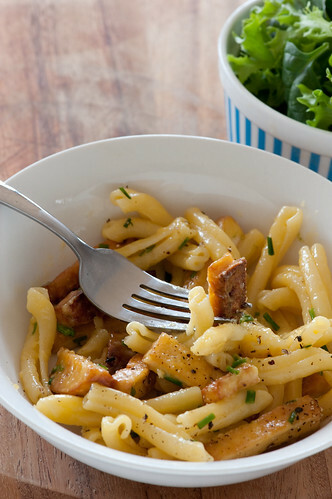 Toss hot pasta through the tofu mixture adding a little of the reserved cooking water if your pasta looks too dry. 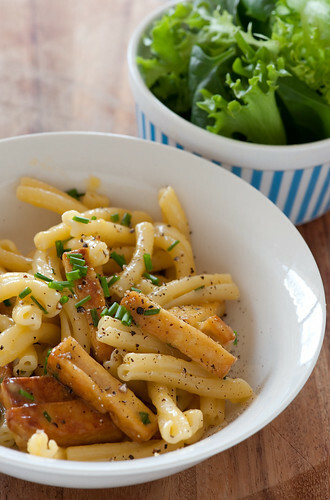 Toss through chives and serve hot with extra parmesan passed separately. 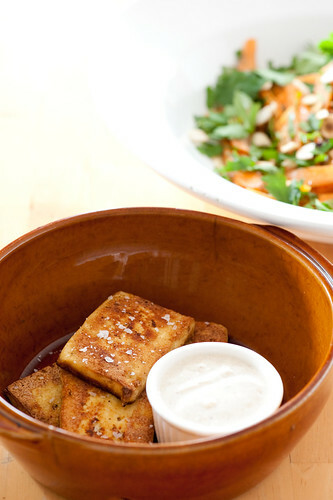 Inspired by the lovely Heidi of 101 cookbooks and her cumin spiked tofu. Actually if you’re looking for more tofu ideas, I’d highly recommend Heidi’s blog. Heidi serves her tofu with a warm carrot salad which is absolutely lovely. Cut tofu into slices about 6mm (1/4 inch) thick and pat dry with paper towel. Heat a large frying pan on medium high and add a few tablespoons peanut or olive oil. Cook tofu until brown and crisp on both sides. Meanwhile combine yoghurt and spices and season well with salt & pepper. Only a few more days left of Vegetarian Month. You can read all about what I’ve been eating HERE. Subscribe to stonesoup by email or RSS to receive your free updates published twice a week. A while back I lived as a vegan for a few years and could not stand the smell of soy sauce, so I used tofu in many western style dishes instead. A Sunday-morning staple was scrambled silken tofu with brown mushrooms and wilted spinach on the side. Now I live in a town where tofu comes in a jar and looks like something out of biology class at uni – floating in yellow water. I miss the stuff – you can mash it and turn it into ‘meatballs’ , blend it with soy or almond milk to make a silky smooth hot chocolate or iced chocolate drink, whip it up with some sugar and eat it with strawberries, make the best ever ‘sausage roll’ filling with lentils and cumin and tomato, use it in a filling for ravioli with roasted mashed vegetables, fry it, DEEP FRY IT (yummo special treat with sweet chilli sauce). You can even make a kind of chocolate mousse with it if eggs are not high on your list of favorite things. I miss it. I love it. More people should give it a go and not just on top of a plate of vegetables or in soup!!! Two great recipes. I had a huge distrust of tofu for no apparent reason. I however like Agedashi Tofu and now have been eating it more. I think I might adopt a vegetarian night each week. Not sure if my monitor colour is out of alignment but your tofu looks very pink around the edges. Pink tofu is a sign it is going off. If you have more tofu than you can eat and need to store it, make sure it is covered in water and kept in the fridge (preferably in an enclosed vessel). Change the water every day until all the tofu is eaten. Ahh, tofu. I’m with your 4 yr old friend.. still, you’ve made me consider MAYBE trying the firm stuff as can’t bear the texture of silken – literally makes me gag (tmi?).. I have a noodle recipe that someone said would work with tofu..
oh, and I bought a new, and totally unnecessary white balsamic vinegar and it is yummy. not so much minimalist today.. tasty though! Tofu is one of my favorites! i love its versatility. I has so many uses and you can cook it for many ways! Love the post. Thanks a lot. michael Z – freezing tofu – another to add to my list of things to try. johanna – do you use silken tofu for the tofu scramble? you seem to have become my tofu guru! When I make veg chili, I like to crumble in tofu that has been frozen. It’s a really easy way to try out the frozen method. The little tofu bits soak up the flavors of the chili, taking on an eerily-meatlike taste and texture. My tofu persuasion involves boiling it in spices before you “cook” it. Seitan and bean curd readily take on any flavor they are exposed to in boiling water. This can add to the complexity of any dish that most non-vegetarians might consider bland by improper cooking. Soybeans. Anyone know where you can buy them? I’m talking beans in their pods. Every time I have Japanese I order a side dish of them, I just love them. But surely they are available to the home chef here in Sydney? In the US, the best place to find whole soybeans, or edamame, is in the vegetable section of frozen foods at the grocery store. They freeze really well and take about 5 minutes to steam back to perfection! I especially love them sprinkled with flaky kosher salt. I’m in Aus and I see frozen packs of green soybeans in the big freezers at the Asian Supermarket. They’ve stocked them all the way from Bris to Syd to Canberra, so they seem to be pretty common…Unfortunately, if you’re rural (severe lack of Asian supermarkets out bush) or in another country, I don’t know if this advice applies. I’m in the big old rural town of Syd-uh-ney ;-) I was hoping for freshies, but I’ll check the freezer, thanks guys. Plan B is growing them…. We often eat tofu which can be used to make a lot of delicious food. We tried the smoked tofu ‘cabonara’ – me being a vegetarian, the other half being an omnivore. I quite liked it but for some reason tofu just never sits right with my stomach – makes me feel a bit queasy. The other half really didn’t like it. I’m considering trying it with Quorn (veggie meat substitute) strips instead of the tofu and seeing how that goes down. I wish we’d liked it better, it sounded so wonderful on screen! Nice post but I was hoping to see sprouted tofu mentioned. I have been told (and research has confirmed) that’s it’s much healthier, including in regards to affecting female hormones, plus easier digestion, and more nutritionally rich. The “firm tofu” you mentioned in plastic trays that isn’t the firm meaty kind is a whole other class of tofu, somewhere between silken and firm. It is used liberally in soups, stuffed, with braises, even simply salted and fried til nicely caramelised. It holds it’s shape better than silken but still offers softness and moistness. My favourite class of tofu! i’m chinese and tofu was a staple in my diet growing up. even now i crave for it. For a quick tofu dessert, you could make some sugar syrup, preferably out of raw or palm sugar or rock sugar and pour it over some silken tofu. absolute heaven. alternatively, sugary ginger water would work too. you can have the dessert either hot or cold. in asia, its eaten both ways. I’ve always been the type of girl who buy tofu products hoping that maybe this time, i’ll like it. I’ve made friends with veggie burgers and tempeh, but tofu continues to be just ‘meh’ for me, each and every time. I just tried this recipe, and lo and behold, a breakthrough! The tofu really was like bacon. I ate the crispy bits right out of the pan. It was delicious! Anyone who is scared of tofu, try this recipe. Jules, I get big blocks of freshly made tofu at my local Asian supermarket, and then perform the miracle trick I learned from a friend: I bake the liquid out of it in the oven before storage. I just bought tofu for the first time EVER and am trying your recipe. If it turns out, I’ll use it tomorrow night in some sauteed veggies and rice. Wish me luck! If you don’t like it, try another brand as they can vary in quality quite a bit. Hi! I love tofu, and I’ve had a hard time frying it without it breaking up, I’m going to try the flour trick you mentioned next time. I love putting tofu in stir fries or just replacing tofu for the chicken in a recipe that calls for chicken. The silken tofu I’ve been told is really good in smoothies, you can’t even tell its there. I have yet to try it though. Tempeh is so. delicious. Go out and experiment with it immediately! I say this as a life-long vegetarian who only really got to know Tempeh when I went to Indonesia a couple of years ago. It was cooked in a thick red sauce that had some sweet and savouriness to it. Tofu and I get along just fine, but this was next-level amazing. I recently visited a vegetarian restaurant in Manchester, England and had pieces of fried tofu, sprinkled with sesame seeds with a katsu curry sauce. Oh and jasmine rice.